Infrared spectrometers come in a variety of types but have many common features. All have a source that emits all the IR radiation of interest. These are usually various solid materials heated to incandescence by an electric current. The radiation energy distribution as a function of wavelength approaches that of a theoretical black body where the energy reaches a maximum at a wavelength (¡m) equal to 2897/T, where T is the absolute temperature (K). The operational temperature is such that the radiation energy is usually at a maximum near the short-wavelength limit of the spectrum (usually ¡m) and decreases as the wavelength gets longer. In the far-IR region, source energy is very low. All spectrometers must have some kind of detector. These are devices that, in one way or another, change radiation energy into an electrical signal that can be amplified and processed to yield a spectrum. Thermal detectors measure the heating effect of the radiation and respond equally to all wavelengths. Examples include thermocouples, bolometers, andpyroelectric detectors. Detectors that utilize photon energy to free bound electrons in the detector material are called photodetectors. Photodetectors, unlike thermal detectors, do not respond to all wavelengths but have a long-wavelength limit where the photon has insufficient energy to excite the electrons. One example is the photoconductive detector, in which the absorption of photon energy promotes bound electrons to free states. This results in increased electrical conduction. In between the source and detector, the spectrometer must have some means of analyzing the radiation so that an intensity can be deduced for each wavelength resolution element. Two completely different types of devices are used, namely, monochromators and interferometers. Monochromators with gratings or prisms are used in dispersive instruments, and interferometers are used in Fourier transform instruments. Most spectra seen in the literature are of the ratioed or double-beam type. A double-beam grating instrument is called a spectrophotometer. In this type of instrument the beam from the source is divided into two beams: a sample beam and a reference beam. The sample is placed in the sample beam, and the two beams are alternately passed into the monochromator through the entrance slit, usually at 13 Hz. FIGURE 9 The grating surface is shown enlarged with incoming radiation from the entrance slit and reflected radiation going to the exit slit. For adjacent grooves, the beams at these angles have a path length difference. 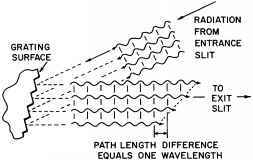 When this equals one wavelength of radiation as shown, all the grooves will emit radiation of that wavelength in phase toward the exit slit. the monochromator toward the detector. When the grating is rotated to a slightly different angle, the path length difference for beams from adjacent grooves will be slightly different, so radiation with a slightly different wavelength will pass through the monochromator. When the spectrometer is set at a given wavelength, the sample beam and reference beam alternately pass through the monochromator and activate the detector. If the two beams do not have the same intensity because of sample absorption, an alternating signal is generated and is used to measure the percent transmission of the sample at that wavelength. The grating angle is changed, and the whole spectrum is generated wavelength by wavelength. Usually, several gratings are used for the whole spectral range, and a grating may be used in more than one order. As the wavelength increases, the slit is widened to allow more energy through to compensate for decreased source emission at long wavelengths. In a Fourier transform infrared (FT-IR) spectrometer, there is no monochromator to disperse or separate the radiation by wavelength. Instead, a whole single-beam spectrum is generated all at once. The intensities of all of the wavelength elements are analyzed simultaneously. Since all the radiation frequencies reach the detector at the same time, there is a large signal-to-noise ratio. This is called the multiplex or Fellgett advantage and is one of the principal advantages that an FT-IR spectrometer has over a dispersive instrument. This advantage is particularly noticeable for low-energy conditions or where scale expansion is required to bring out very weak bands. There is also an advantage in that the spectrum can be recorded in less time. FIGURE 10 Michelson-type interferometer. Left: Source radiation is transmitted and also reflected by a beam splitter to two mirrors. Right: Both mirrors reflect radiation back to the beam splitter, where interference occurs. ically at 45°. Ideally the beam splitter transmits half the radiation striking it and reflects the other half. One type of beam splitter is a thin layer of germanium coated on an IR-transmitting support. The transmitted and reflected beams leave the beam splitter at right angles, and both strike mirrors, which return the two beams to the beam splitter. The two beams recombine at the beam splitter and show interference. The radiation leaving the beam splitter may go back to the source or may go at right angles, passing through the sample and going on to the detector. One of the two mirrors is movable, so its distance from the beam splitter can be varied. The path length difference for the two beams in the interferometer is called the retardation and is two times the displacement of the movable mirror from the equidistant point. If a monochromatic source such as a laser is used, the radiant energy reaching the detector will vary as a cosine function of the retardation. The detector response will reach a maximum every time the retardation is an integral number of wavelengths of the radiation. At this time the beams from the two mirrors combine at the beam splitter in phase for the beam going to the detector and show constructive interference. If the movable mirror is then moved one-quarter of a wavelength of radiation, the retardation is changed by one-half of a wavelength. The beams from the two mirrors combine at the beam splitter one-half of a wavelenth out of phase for the beam going to the detector and show destructive interference. The detector response as a function of the retardation is called the interferogram. The spectrum can be generated from the interferogram by a Fourier transform. The Fourier transform of a single cosine wave-type interferogram is a single wavelength, in this case that of the laser source. If a polychromatic source is used, its spectrum can be thought of as a series of closely spaced laserlike emission lines, each with its own wavelength and intensity. Each of these generates a cosine function-type interferogram. The interferogram of a polychromatic source of radiation is a summation of all the cosine functions for each of the laserlike resolution elements. An interferometer does not produce a spectrum but produces an interferogram. A computer must be used to perform the Fourier transform, which generates the spectrum from the interferogram. Once this is done, the computer is available for further processing of the spectrum. Just one scan of the movable mirror produces a whole single-beam spectrum. However, a spectrum produced from one scan has a relatively high noise level. Usually, a number of scans are taken and signal-averaged by the computer. The noise is reduced by the square root of the number of scans. A single-beam spectrum with the sample in place is stored in the computer memory. A reference single-beam spectrum is taken without the sample and is also stored in the memory. These two single-beam spectra are ratioed by the computer to give a percent transmittance spectrum. The computer can be used to modify the spectrum further. For example, the vertical or horizontal scale can be expanded, the background can be straightened, or a linear absorbance scale can be generated. A useful procedure is spectral subtraction whereby, for example, a solvent spectrum can be subtracted from a solution spectrum to yield the pure solute spectrum.